A French eatery, a bike and hardware shop, a wine store and a CVS are slated to open at a development on the Southwest waterfront next year. A representative for the development shared the news in a press release this morning. La Vie, a French and Mediterranean restaurant “that includes an extensive moules-frites menu, a wide selection of sweet and savory tartines and a variety of coastal-inspired beverages,” will open along “The Wharf’s most expansive and stunning vistas,” according to the release. Foggy Bottom-based District Hardware and Bike is also coming to the Southwest development. The 50-year-old hardware store will open a new 6,300-square-foot shop next year, according to The Wharf. Likewise, Union Market’s Cordial Craft Wine, Beer and Spirits will occupy a 525-square-foot space in the development. Pharmacy retailer CVS will also open a 9,000-square-foot store in the development, the press release reads. Social Restaurant Group’s 9,800-square-foot concept La Vie, their largest venture to-date, will feature French-Mediterranean cuisine that includes an extensive moules-frites menu, a wide selection of sweet and savory tartines and a variety of coastal-inspired beverages. Situated along The Wharf’s most expansive and stunning vistas, their space boasts a 1,100-square-foot waterfront terrace, and serves the resident pool deck above. La Vie also includes private access to a 5,000-square-foot rooftop terrace, poised to be Washington’s premier events space. District Hardware and Bike, the nearly 50-year old family-owned hardware store, full-service bike shop and now café and water sport retailer, is expanding from its current location in Foggy Bottom. Their new 6,300-square-foot location will be designed by Natalie Park Design Studio and is the latest in a series of expansions for the store, which has been owned and run by the Conway family for three generations. To strengthen the concept, District Hardware and Bike has teamed up with local coffee roaster, Vigilante Coffee, to help design and launch the new café and coffee bar. Cordial Craft Wine, Beer & Spirits by Eric Rohleder is expanding from its current operation in Union Market. 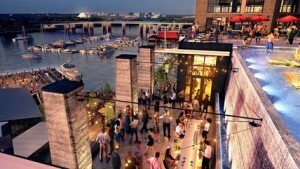 His 525-square-foot location at The Wharf will feature a water view and products from independent importers and boutique distributors across the globe. 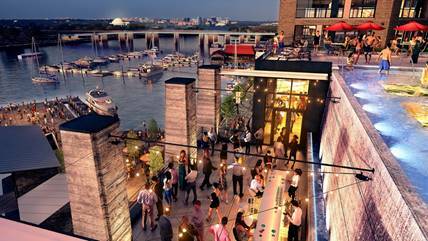 America’s largest pharmacy retailer CVS will occupy a 9,000-square-foot space at The Wharf.